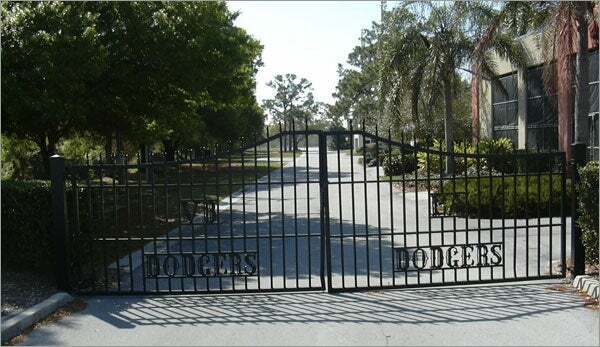 The gates at Dodgertown are closed and locked for the first spring in ages. The following is the first of an occasional series by Charles Fountain on the history and culture of spring training. VERO BEACH, Fla. — Oh the metaphors! A thick fog hung over the Indian River early last Saturday morning, swallowing up the horizon as I made my way from the Vero Beach barrier island to the mainland and an appointment at Dodgertown, dormant this year after 61 years as the spring training home of the Brooklyn and Los Angeles Dodgers. Dodgertown’s future, too, is enveloped in fog, its horizon invisible in a political and financial uncertainty. When I get there, the gates are locked. Elsewhere on this Saturday, across Florida, and, most notably for Vero Beach, 2,500 miles away in Glendale, Ariz., another spring training is beginning. Pitchers and catchers stretch and jog and play long toss, and school kids and their grandparents watch. Yet at the most venerable and most accessible of spring training sites — where every Dodger since Robinson, Hodges, Campanella and Snider had walked the same paths, and the fans walked right alongside them, where there were never any roofs on the Holman Stadium dugouts and Tommy Lasorda would carry on conversations with friends in the front row of the stands while the game played on behind him — here in this most fan friendly of places the gates were locked and the only way in was to trespass. So Russ Lemmon and I walked around some bushes near the maintenance building, and made our way to some benches behind one of the practice fields, where in other years, pitchers would be practicing covering first on a grounder hit to the right side of the infield. No one bothers us. Nobody’s even there to see us. Russ is a columnist for the Vero Beach Press Journal, and we’d agreed to meet to talk about Dodgertown, and about my book on spring training. I like talking to journalists in situations like these. A good reporter generally has a pretty thorough grasp of an ongoing story like this, and will talk about it with more passion and clarity than any bureaucrat. By 2007, the Dodgers had already announced that they’d be moving their spring training to Arizona, and much of that resentment in Vero Beach was naturally directed at Dodgers owner Frank McCourt. But a greater share of the anger these days is directed at county officials, for what a lot of people feel has been a bungling of negotiations to get the Baltimore Orioles to replace the Dodgers. At a book-signing event in Vero Beach last Monday I was asked: “Do you think it was arrogance or incompetence that kept the county from getting this deal with the Orioles?” I was neither qualified nor inclined to try to answer that do-you-still-beat-your-wife kind of question, but I thought it telling of the community mood. The taxpayers are very testy when it comes to this county-owned facility. It was less than a decade ago that Indian River County invested $19 million to purchase Dodgertown from the team, upgrade the facility and lease it back to the team for $1 a year, to prevent them from selling the property to developers and moving to Arizona. When the Dodgers announced in the fall of 2006 that they’d be leaving for Arizona anyway, there was a sense in the county that it had been played, and whatever love was left between city and team was eroded even further. When county administrator Joseph Baird announced in August of 2007 that he had reached tentative agreement with an unnamed major league team to take over the Dodgers lease, the people of Vero Beach began giving their hearts over the Baltimore Orioles, as rumor, then news reports, then finally official confirmation revealed that the Orioles were the unnamed team with whom the county had its agreement. The country offered up $14 million in improvements to Holman Stadium, and everything seemed on track; but a number of 2008 deadlines came and went and the Orioles — who are training on a year-to-year lease in Fort Lauderdale but are certain to be going elsewhere — refused to pull the trigger on their deal with Vero Beach. Instead they started talking to Sarasota about maybe going there when the Reds leave for Arizona after this year, and then to Fort Myers, after it was announced in the fall that Lee County would build a new complex for the Red Sox. Growing increasingly frustrated at the stalled negotiations, the Indian River County Commission voted unanimously in December to rescind its offer to the Orioles and ordered a 30-day, cooling-off moratorium on further talks. The moratorium elapsed in mid-January but there have been no conversations between the county and the team — and none scheduled. The Orioles are currently the only girl without a date for the prom. Every other major league team is tied to a long-term lease in a facility that has been built or upgraded within the last dozen years. Barring any unforeseen natural disaster or economic calamity laying waste to another city’s facility or lease, there will not be another major league in play for a decade or so, after the Orioles finally make their decision. So there is great urgency to this; the window is small. In recent weeks, it’s been looking more and more like the Orioles might commit to Fort Myers, taking over City of Palms Park when the Red Sox new facility opens in 2013. But while plans for the Red Sox facility are moving forward, they are still conceptual, and in this economy, they will remain controversial and problematic. Bob Ryan’s Friday column in the Globe speaks with great detail about the perils of spending public money on baseball in these troubled days. Without a new facility for the Red Sox, there will be no place for the Orioles in Fort Myers. So Vero Beach remains very much in the mix for the Orioles — assuming the county commission wants it to be. Now why should anyone beyond Vero Beach and Indian River County care about any of this? After all, the Grapefruit and Cactus League maps are littered with cities that once hosted spring training and now do just fine without it — thriving towns like Miami, Orlando, Cocoa, Yuma and Chandler among them. Last year, St. Petersburg and Winter Haven surrendered spring training without a fight, believing baseball was no longer necessary to their identity or economy. A drive down A1A in Vero Beach, past the estates and gated communities and mile after mile of unbroken landscaping, would seem to suggest Vero Beach will get along just fine without baseball as well. But the Vero Beach spring training complex — at some point we’ll have to stop calling it Dodgertown, won’t we? — is a singular place, and the romantics in baseball — and there are still plenty of us left — will miss it if it’s gone. Holman Stadium is spring training’s Fenway Park and Wrigley Field; there’s never any confusion about where you are when you’re sitting in Holman. There is a physical appeal to the property and it remains spring training on a human scale. As spring training has grown in popularity, so too have the height of the fences and the distance between fan and player. For the time being at least, Vero Beach retains spring training’s old-time intimacy like no place else. Today, the locked gates only keep people away, and Vero Beach can only hope that they will not remain locked forever.